More than a century after its discovery and four millennia after it was entombed, the head of a Middle Kingdom (2040-1640 B.C.) 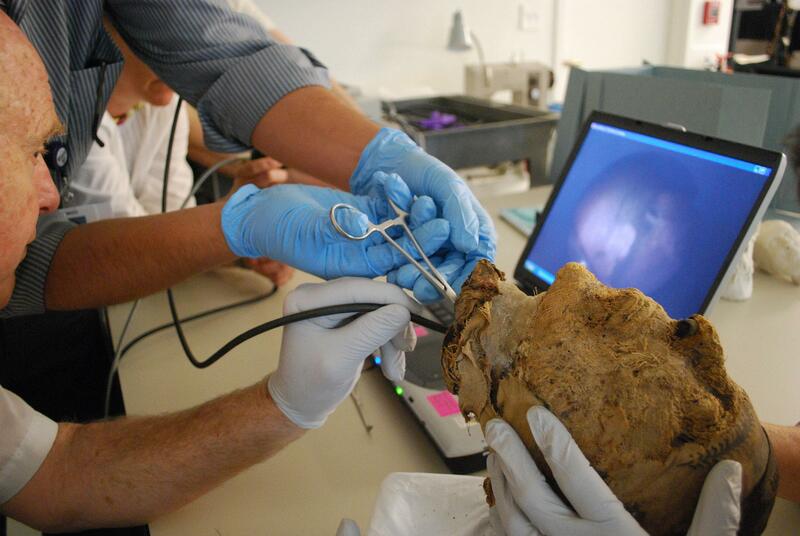 mummy has been identified by FBI forensic specialists using DNA analysis. Even with all the advances in the retrieval of archaeological DNA over the past decade, the odds of success were slim because this poor head has been through the wringer. 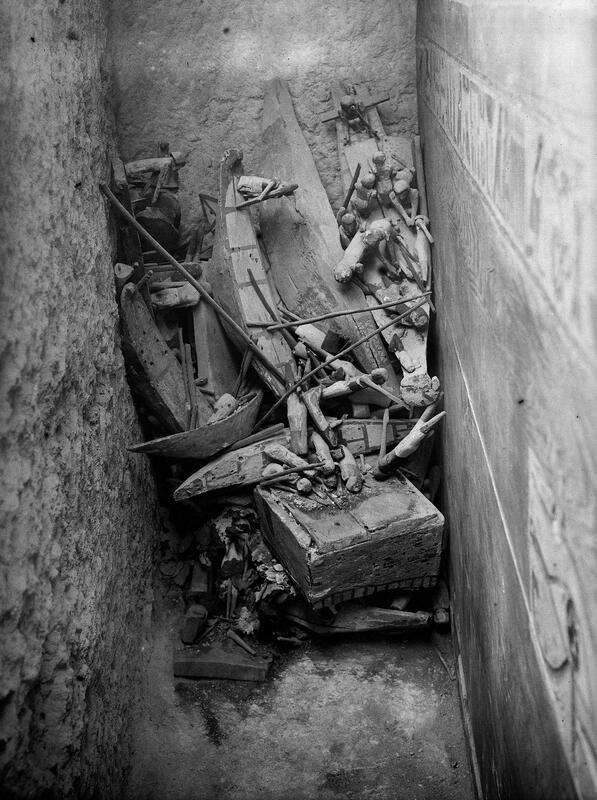 First, it was entombed in the necropolis of Deir el-Bersha on the east bank of the Nile in Middle Egypt where the blazing heat of the Eastern Desert destroys DNA in short order. Then it was abused in the most callous fashion by looters who broke into the tomb in antiquity. After plundering the tomb of its precious metals, the thieves tossed aside a mummified body which ended up in two pieces — the torso, sans limbs, and the head. They tried to set the limestone chamber on fire to obscure the evidence of their crime, but thankfully failed and what was left of the human remains, not to mention some exceptional wood artifacts, survived. Hundreds, perhaps thousands of years later, the tomb’s denizens had another close call, this time at the hand of archaeologists. George Reisner and Handford Lyman Story discovered the burial shaft of what they would name Tomb 10A under some boulders in 1915. The shaft was 30 feet long and space very tight, so Reisner and Story dynamited their way in. Recklessly explosive entry notwithstanding, the team found beautiful and rare painted wooden coffins, figurines and pottery that had been roughly piled up and tossed around by the ancient looters. Four coffins, canes and dozens of models depicting daily life on the estate of a high official including 58 boats, artisan workshops and a religious procession featuring a male priest leading female bearers of offerings. 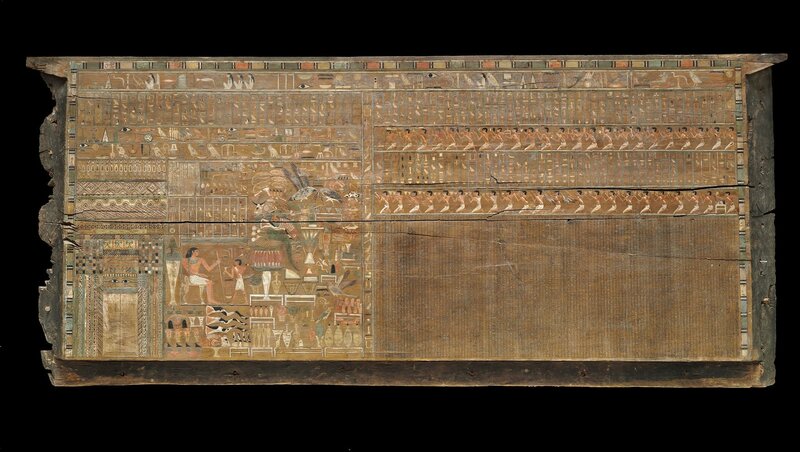 It was the largest assemblage of Middle Kingdom funerary artifacts ever discovered. They also found a mummified head on top of one of those coffins and the disarticulated torso in a corner. 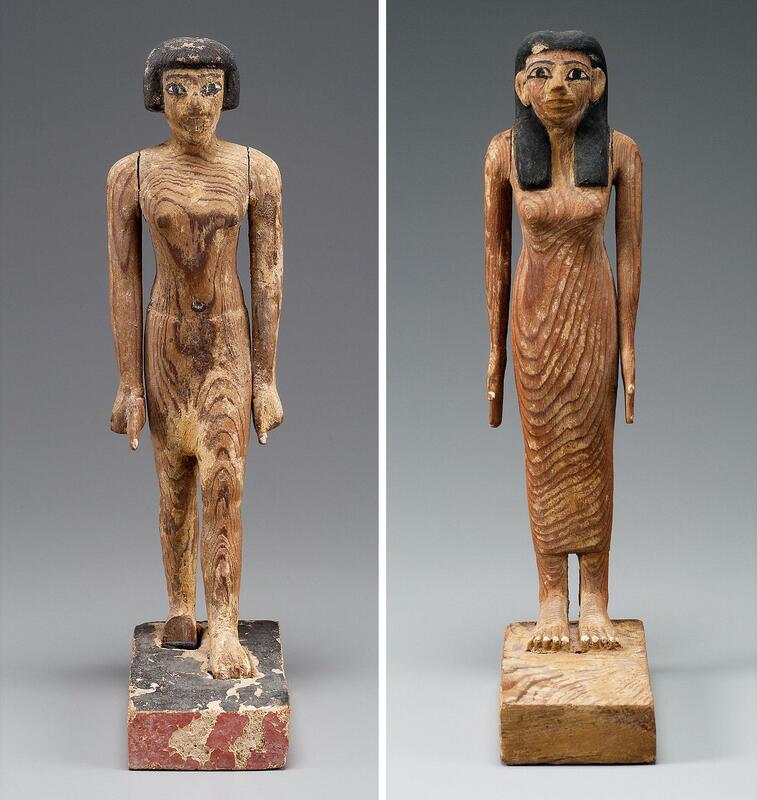 The wood objects and the head were sent to the Museum of Fine Arts, Boston, which had co-sponsored the dig, in 1921. They had their next brush with destruction on the trip across the Atlantic when the ship caught fire. The crew managed to control the flames and the contents of the tomb made it through with minimal water damage. At the time, there wasn’t a great deal of interest in these types of materials, so most of them were put in storage. Only the religious procession and the finest painted of the coffins were put on display. Finally in 2009 the full assemblage was rescued from obscurity and displayed in an exhibition dedicated to the finds: The Secrets of Tomb 10A: Egypt 2000 BC. 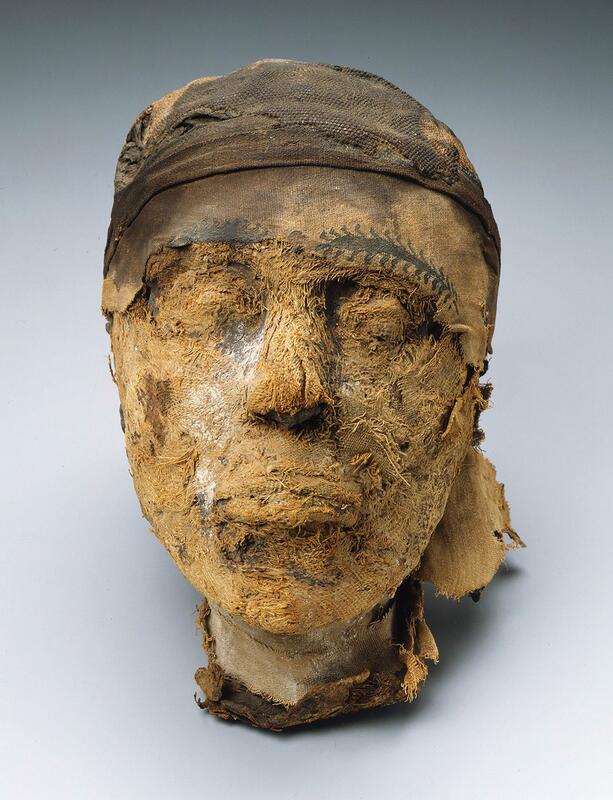 The mummified head was one of the stand-out items. Its serene visage, head wrap with painted on eyebrows and curly hair visible through the linen bandages made a striking impression, as did the fact that nobody knew for sure who the head had belonged to in life. Inscriptions had identified the tomb as that of the Great Overlord of the Hare (15th) Nome, Djehutihotep, and his wife, but it wasn’t clear whether the head was male or female. Expert opinions differed and even as recently as 2009 it was thought to be impossible to retrieve viable, uncontaminated DNA from an Egyptian mummy. The MFA had doctors at Massachusetts General extract a molar from the head in the hope it might contain a precious clean sample protected by the tooth’s enamel. Several teams of scientists tried to recover DNA from the tooth since the 2009 extraction, but to no avail. In 2016, the FBI’s forensic specialists were enlisted. The F.B.I. had never before worked on a specimen so old. If its scientists could extract genetic material from the 4,000-year-old mummy, they would add a powerful DNA collecting technique to their forensics arsenal and also unlock a new way of deciphering Egypt’s ancient past. In the F.B.I.’s clean lab, Dr. Loreille drilled into the tooth’s core and collected a tiny bit of powder. She then dissolved the tooth dust to make a DNA library that allowed her to amplify the amount of DNA she was working with, like a copy machine, and bring it up to detectable levels. To determine whether what she had extracted was ancient DNA or contamination from modern people, she analyzed how damaged the sample was. It showed signs of heavy damage, confirmation that she was studying the mummy’s genetic material. She plugged her data into computer software that analyzed the ratio of chromosomes in the sample. “When you have a female you have more reads on X. When you have a male you have X and Y,” she said. And thus at long last, the Great Overlord Djehutynakht reclaimed his head. This entry was posted on Wednesday, April 4th, 2018 at 11:30 PM	and is filed under Ancient, Modern(ish). You can follow any responses to this entry through the RSS 2.0 feed. You can skip to the end and leave a response. Pinging is currently not allowed.